Now ReadingThe Ultimate Holiday Checklist: 23 Things to Do in L.A. The Ultimate Holiday Checklist: 23 Things to Do in L.A. Here in Los Angeles, we do up the holidays with a little something extra, like oceanside fun runs, ice-skating underneath palm trees and smooth jazz Christmas ensembles. Here is our decidedly non-boring, something-for-everyone holiday roundup. 1. Get snowed on every night under Los Angeles’s tallest Christmas tree, at The Grove at 7 and 8 p.m.
2. Visit Skypark at Santa’s Village. It’s a quaint 1950s-era theme park with cute little cabins where Santa lives and thrill-seeker attractions like a boulder-climbing room and an archery range. 3. Eat as many Lebkuchen—those spicy white-frosted little mounds of a Christmas cookie—as you possibly can in one sitting. 4. 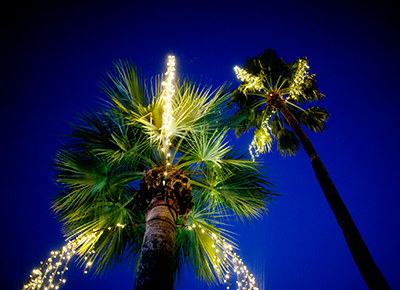 Experience the magic of holiday lights—all 4.5 million of them—at the over-the-top Festival of Lights celebration at the Mission Inn and Spa in Riverside. Ablazing 'til January 7, there's still time for a staycation. 5. So many lights, so much water: That’s the 108th Newport Beach Christmas Boat Parade and Lights on December 14 to 18. 6. Or if you want to class it up, listen to “Hallelujah” at the Walt Disney Concert Hall when Handel’s master choral work Messiah is performed by the Los Angeles Philharmonic with La Chapelle de Québec. How fancy. 7. Answer a child’s letter to Santa Claus. 8. Wait in line (starting at 5:30) on December 16 for a ticket to the outdoor sing-along "Do You Hear What I Hear?" Sure, it’s free, but singing your heart out under the stars? Priceless. 9. Nothing says Christmas in SoCal like a 5/10K oceanside run dressed in a Santa’s Little Helper costume. Nothing. 10. Ice-skate amid the palm trees and skyscrapers at the Holiday Ice Rink Pershing Square. 11. Blow the steam off a nice big bowl of delicious matzo ball soup at Langer’s and pretend it will actually snow in L.A.
12. Enjoy the smooth tunes of A Charlie Brown Christmas as interpreted by jazz pianist David Benoit and the All-American Boys Chorus on December 17. 13. Or go a completely different route with Christmas Queens, a musical evening with your faves from RuPaul’s Drag Race on December 17. 14. What’s more Christmassy than John Hughes’s classic story of child endangerment, Home Alone? How about a staged musical parody of it at Silverlake’s Rockwell Table and Stage? 15. Take advantage of that handful of days when you can wear a polar fleece and stroll an outdoor holiday market. 16. Or browse our favorite indie bookshop for personal (and actually affordable) gifts. 17. Gift Linda?s Latkes, the little Oprah-endorsed potato pancakes that you can have shipped next-day delivery to practically anywhere. Mmm. 18. You?ve probably only seen It?s a Wonderful Life only during fuzzy TV broadcasts, but from December. 20 to January 1 you can see Jimmy Stewart play the Everyman hero in 35 millimeter at Cinefamily at the Silent Movie Theatre. 19. Take your visitors to do something super touristy that you?ve always secretly wanted to do (hello, martinis at Chateau Marmont). 20. Rule your holiday party by buying yourself a super-trendy silk pajama suit (and then wear it the next day to lounge around in). 21. You have not just one but five Nutcrackers to choose from: The American Ballet Theatre one (from New York! ), December 16 through 18; the Long Beach Ballet one (pyrotechnics! ), December 10, 11, 17, 18; the Moscow Ballet (falling snow! ), December 16 and 17; the Hot Chocolate Nutcracker (scored by Mariah Carey! ); and the Los Angeles Ballet (special appearance by Santa! ), through December 24. 22. Everyone’s favorite brittle funnywoman Jane Lynch has a new holiday album called Jane Lynch’s A Swingin’ Little Christmas! And there will be some toe tappin’ and head swayin’ at Largo at the Coronet’s CD release show on December 21. 23. Enjoy a Christmas Eve feast, jolly old England-style, at Brit gastropub The Pikey. You’ll have goose neck risotto (gulp), homemade pigs in blankets, buttered Brussels sprouts and mincemeat ice cream. RELATED: Quiz: Which L.A. TV Character Are You Most Similar To?